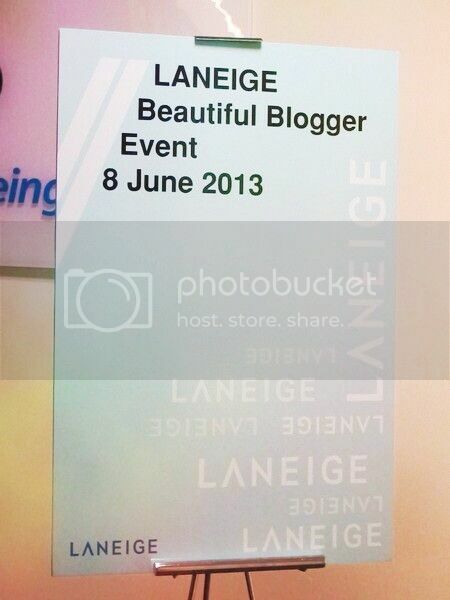 Last Saturday, I was one of the top 10 bloggers to be selected to join the Laneige K-Beauty Blogger Workshop at Centrepoint, Midvalley. I am really fortunate enough to be selected as part of the team to join the workshop. 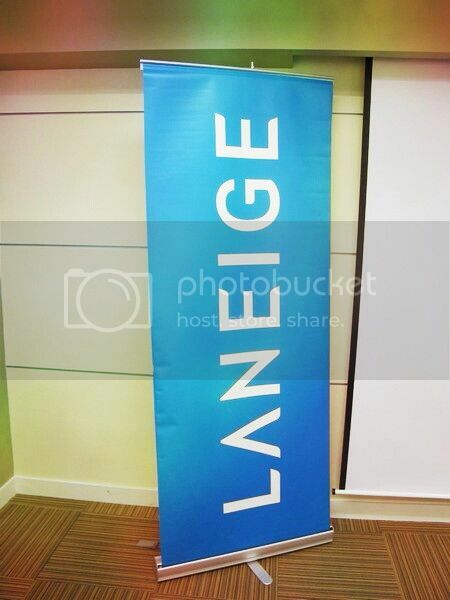 Thank you Nuffnang and Laneige for the once-a-lifetime opportunity. 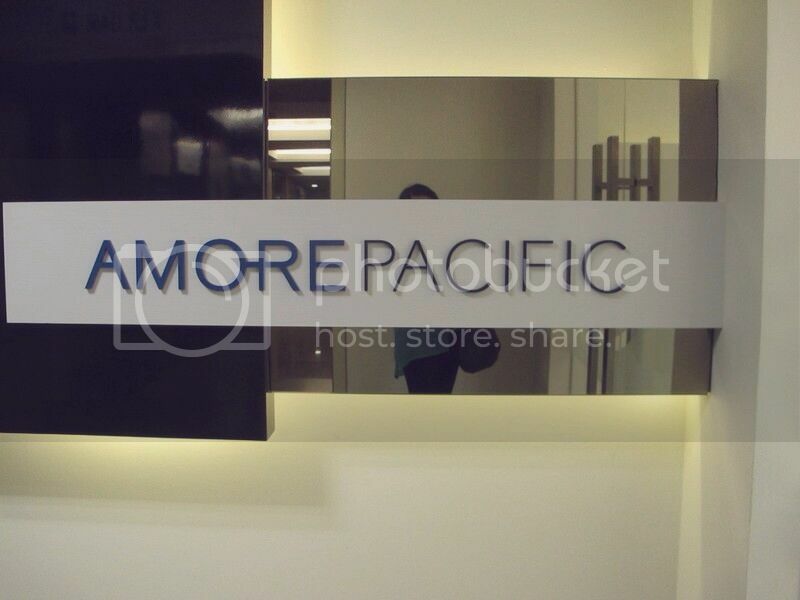 I was at the Amore Pacific office which is located at the Centrepoint, Midvalley half an hour earlier because I was afraid that I might be lost in Midvalley looking for the office. 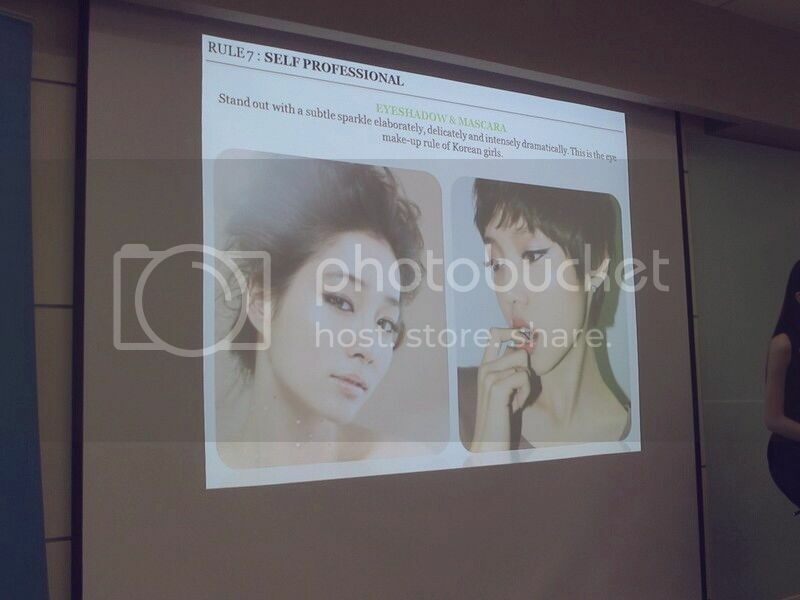 I was kinda excited to this workshop as I get to learn some tips on how to achieve Korean beauty look. Back to the topic. 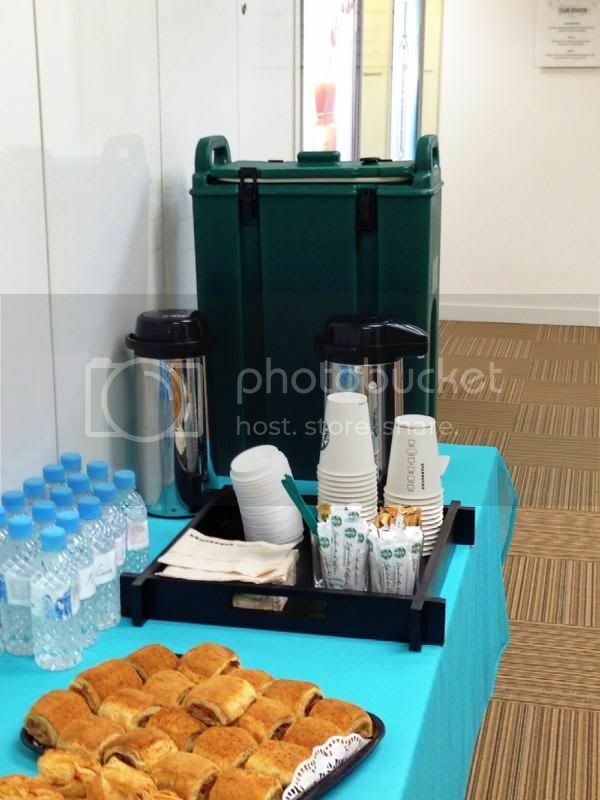 While waiting for other bloggers to turn up, I began to take photos around the office. I actually spotted their best seller products which are the Laneige Snow BB Cushion, Water Bank Essence, Water Sleeping Pack and White Plus Renew Essence. 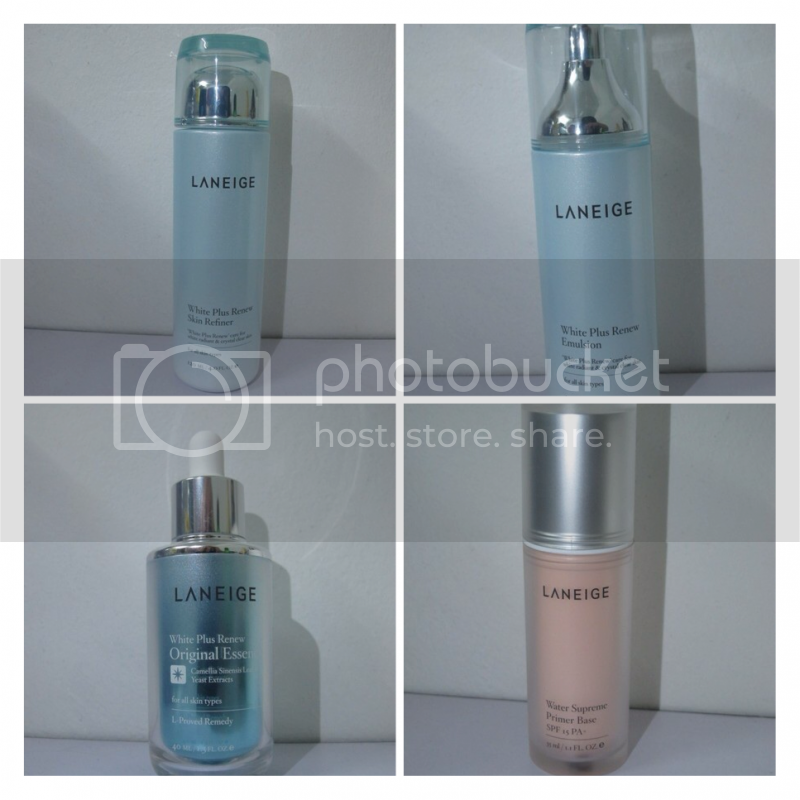 Laneige Water Bank Essence and Laneige Water Sleeping Pack. 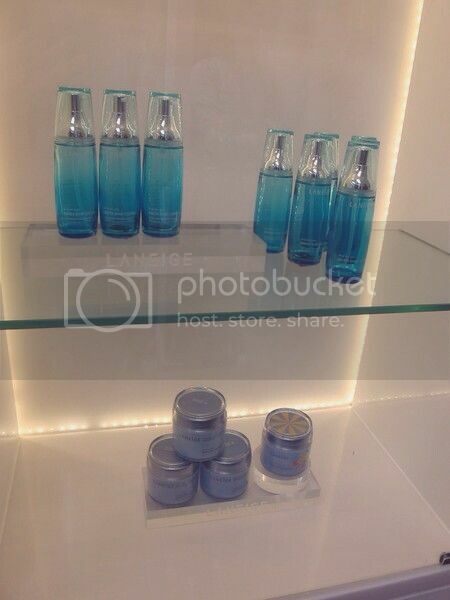 Even the top Korean celebrity, Miss Song Hye Gyo, the brand ambassador for Laneige, personally love this product. "I am sure everyone has had this experience - that it is not very easy to find a flawless makeup that fits their skin tone. But Laneige Snow BB Cushion is what I have been looking for. 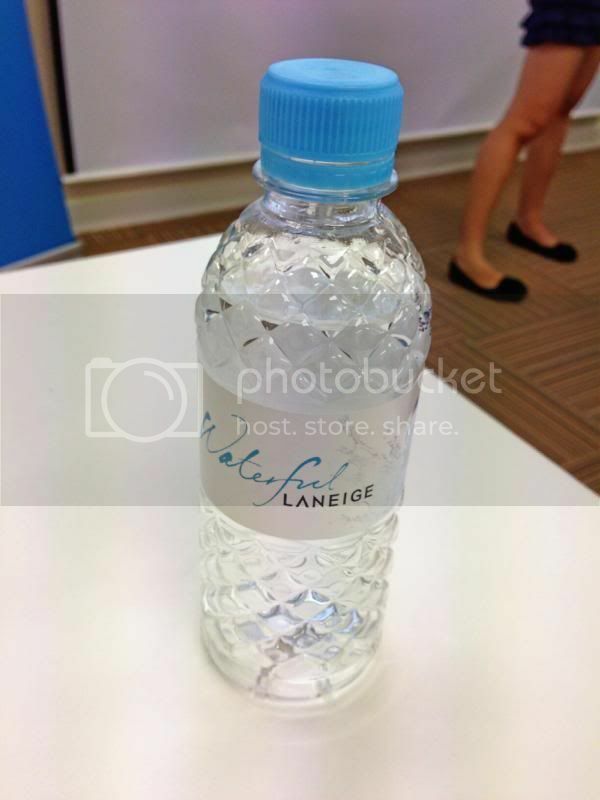 It offers high skin affinity to appear as natural as my own skin"
Cute Laneige Drinking Water Bottle. 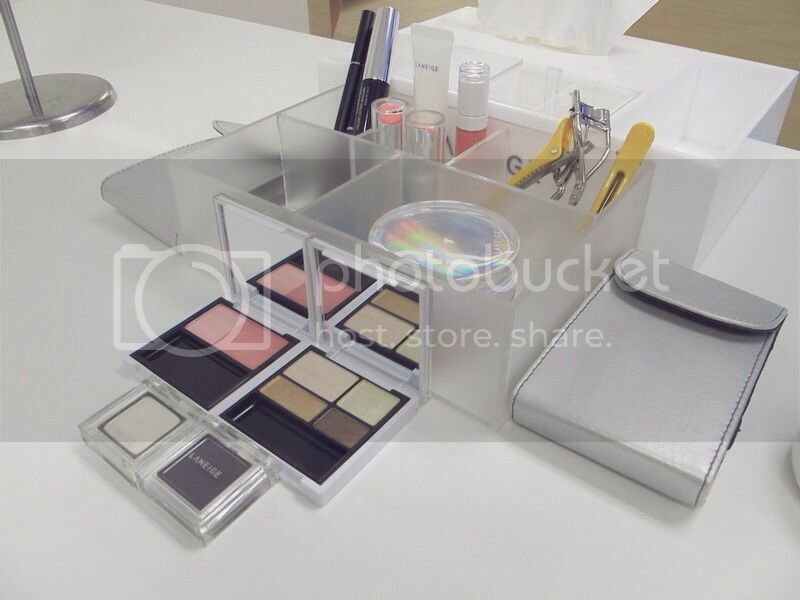 We were told to remove all the makeup as we need to have hands-on experience on applying makeup to create Korean beauty look. 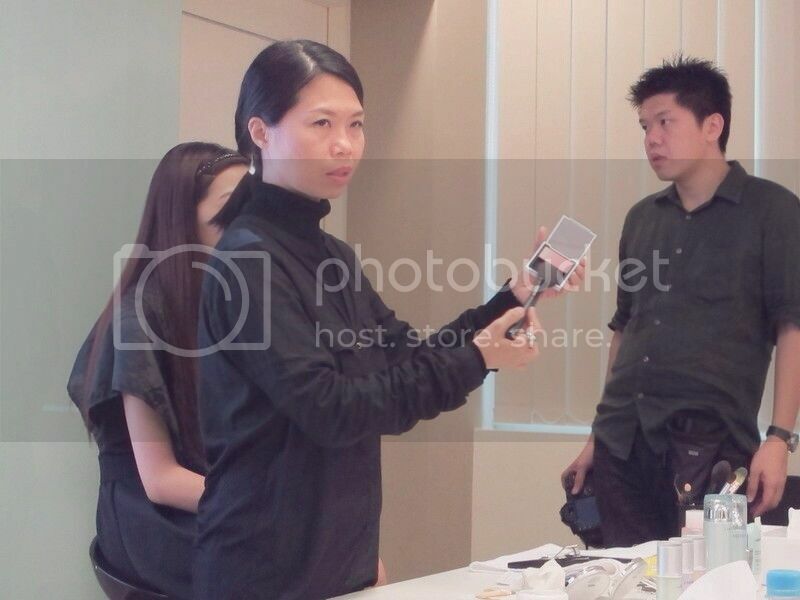 The makeup artist, Miss Geraldine Loy was there to teach us on how to apply makeup on the face. 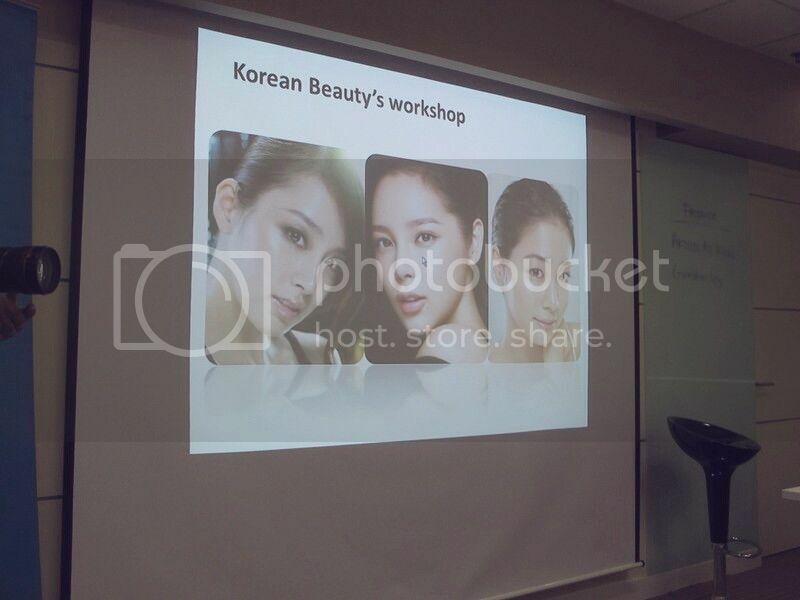 Presentation slides on Korean beauty look in this workshop. 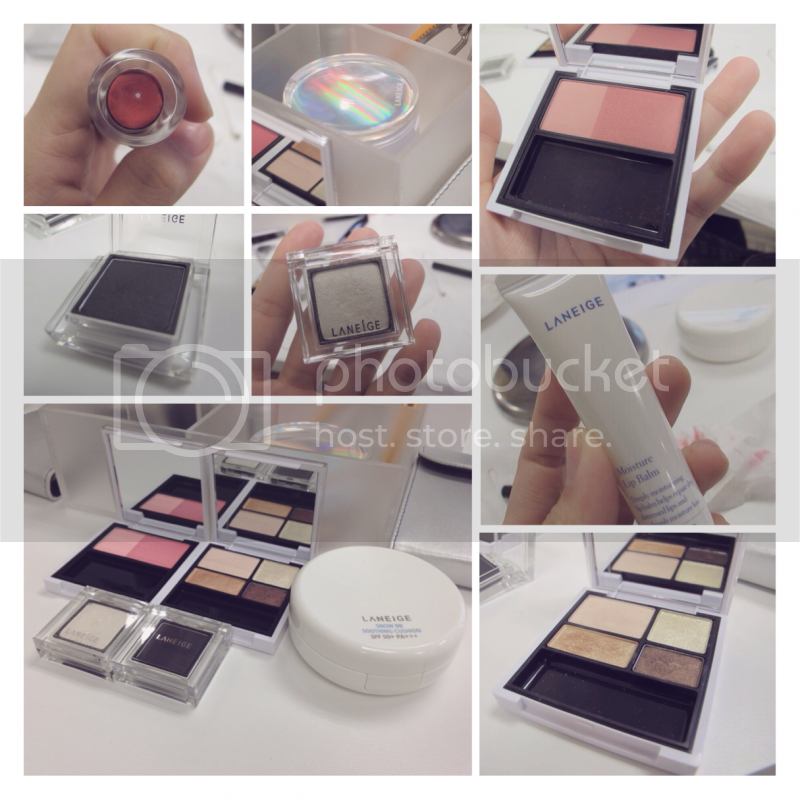 Some of the makeup products to create the K-beauty look. 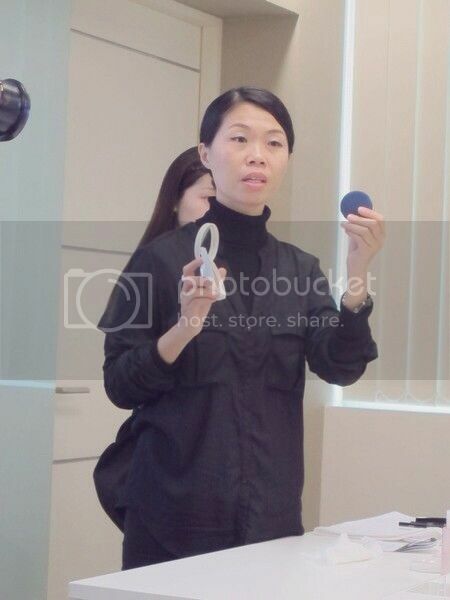 On the other hand, Miss Geraldine taught us on step-by-step makeup tips. She was so patient enough to teach all of us. 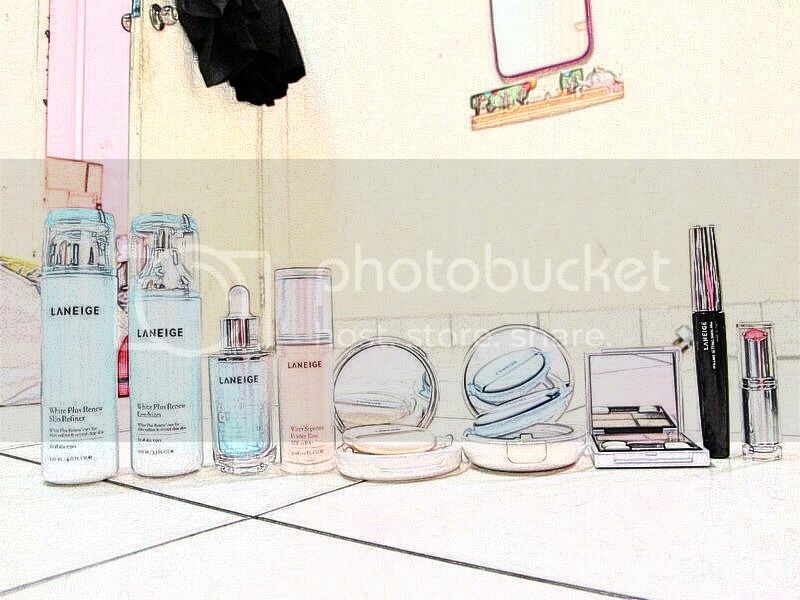 She guided us all through from the skincare to makeup tips.There are basic 4 steps in the Laneige Skincare routine. We always start Korean skincare layering routine after cleansing of the face. 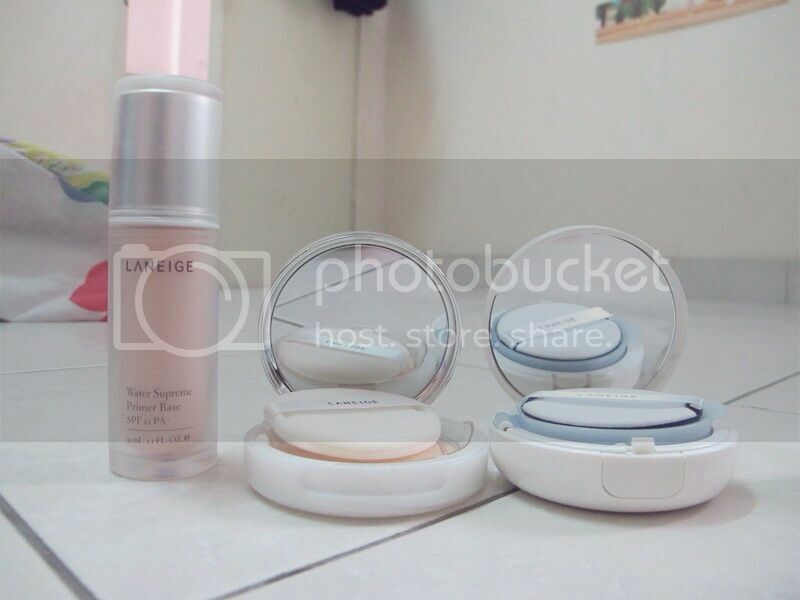 Clockwise from left to right: Laneige White Plus Renew Skin Refiner, Laneige White Plus Renew Emulsion, Laneige White Plus Renew Essence and Laneige Water Supreme Primer BBase SPF 15 PA+ in Light Pink. 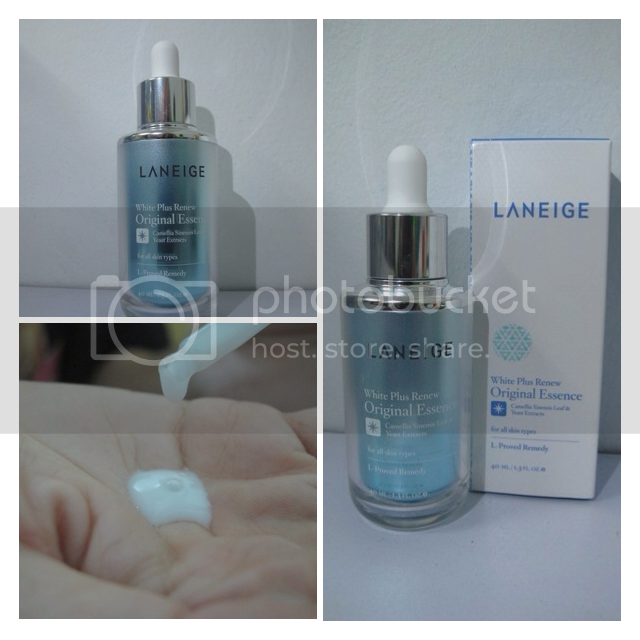 The first step is Laneige White Plus Renew Skin Refiner to remove the makeup residues, impurities and dead cells followed by Laneige White Plus Renew Emulsion which forms a moisture barrier, keeping the skin brighter and more transparent. The third step would be Laneige White Plus Renew Essence. 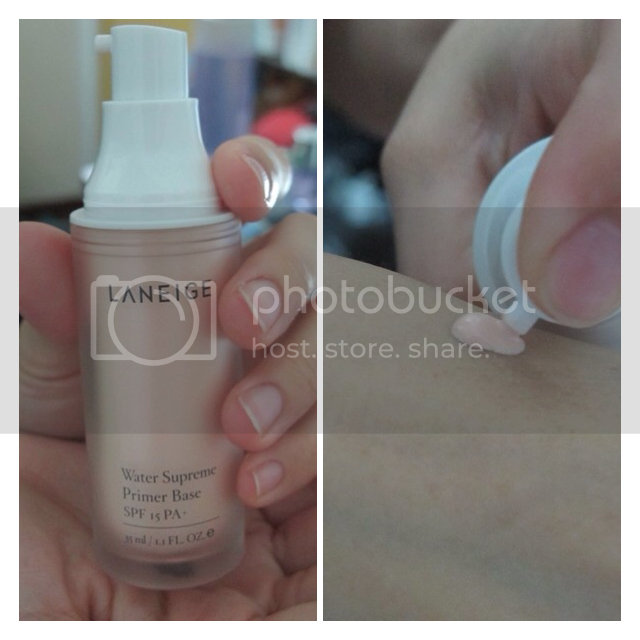 The final step for protection is Laneige Water Supreme Primer Base SPF 15 PA+. 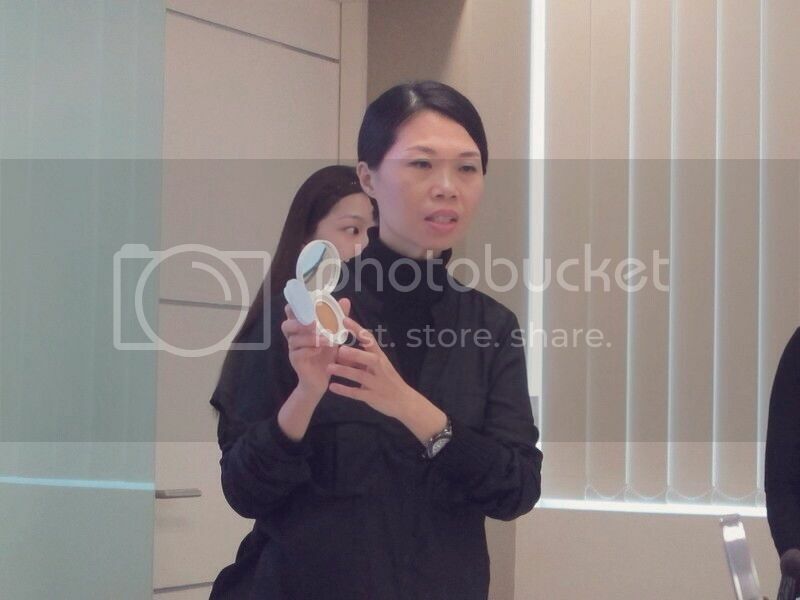 Miss Geraldine explained on the benefits of the Snow BB Cushion. 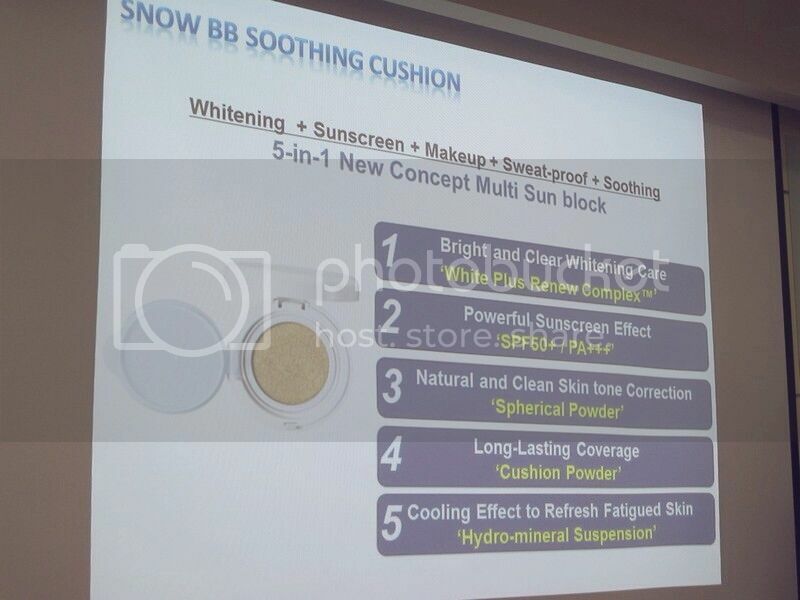 Snow BB Soothing Cushion has all-in-one miracle worker that takes care of our skin inside out. It combines the benefits of whitening, sunscreen and makeup base products, for skin that’s dewy fresh, clear and protected. It protects us from the harsh effects of sun exposure with its SPF 50 PA+++ while giving us the fresh coverage that we need, especially if we’re out and about under the sun. Not only that, this Snow BB Cushion can be carried anywhere we like because of its size. 1. Sweat-proof - The sweat-proof formula helps to ensure the makeup stays unspoilt and beautiful throughout the day. 2. Whitening - Contains patented White Plus Renew Complex with strong melanin reduction ingredients for increased skin luminosity. 3. Hydration - Unique hydration technology forms a Hydro-mineral suspension, providing 30% more moisture to the skin with each application. 4. 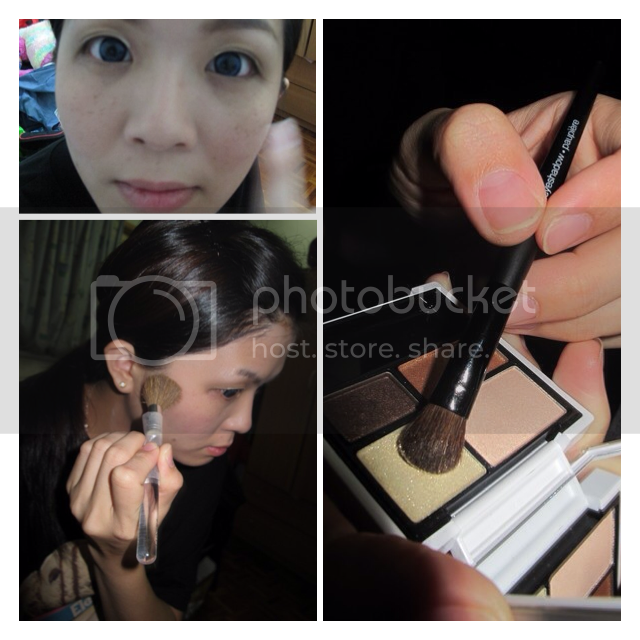 Makeup - Provides long-lasting coverage against blemishes and dark eye circles. 5. SPF 50 PA+++ - Acts as a sunscreen with SPF 50 PA+++ to protect skin from the sun's damaging UV rays. She also explained the tailor-made puff which is different from the normal puff that we normally used. The materials which rubycell and poly-urethane are processed with a special technology that is able to hold nine times more water than its weight for supple and glossy skin. The texture is known as the new-generation puff as it is able to conceal the pores and makes the face radiant and natural-looking skin with its firm and supple texture. Miss Geraldine was showing on how to apply on the temples of the face. 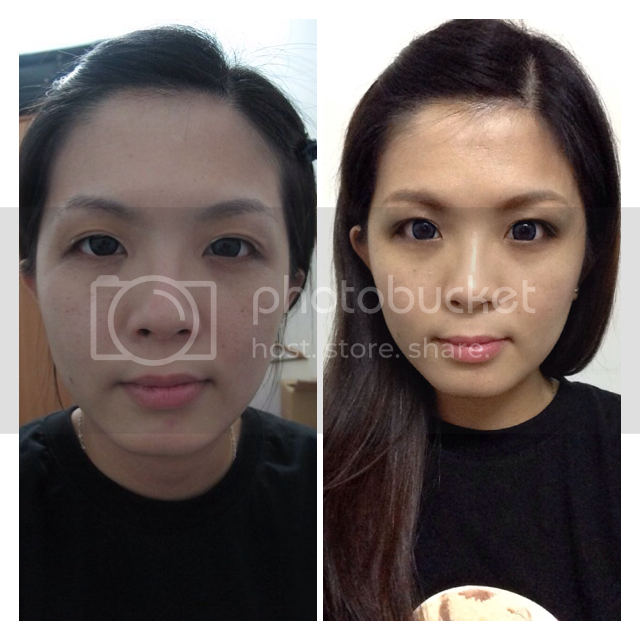 Powder brush was used to create the matte look on the skin after the Snow BB Cushion application. Miss Geraldine taught us on how to apply the blusher on the cheeks. We created two looks that day. The day look and night look are approximately the same. The difference was that we emphasize more on the eyes by drawing eyeliner thicker on the lower eyes and put on highlighter on the temples, T-zone and forehead to create the shimmery look. 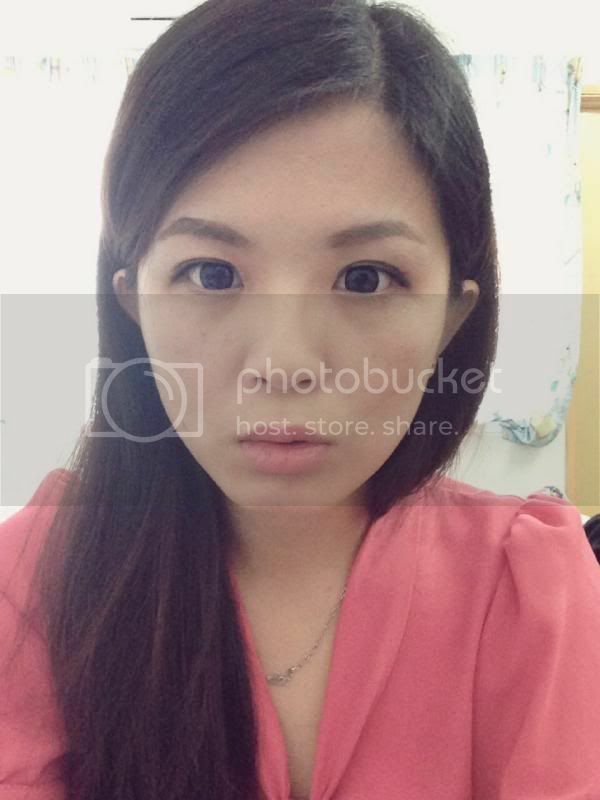 Presentation slides on Korean beauty night look. 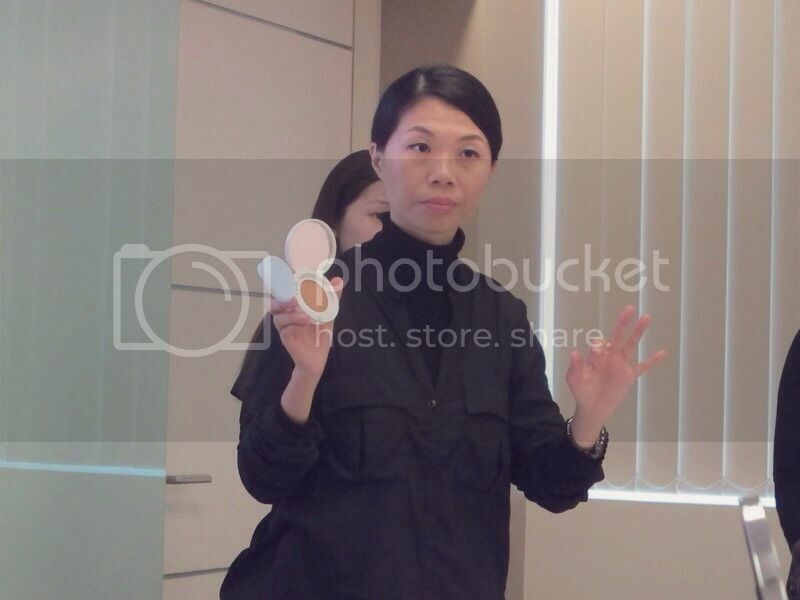 Miss Geraldine taught us on how to apply powder especially on the eye area after eyeliner was drawn on the lower eyes.. 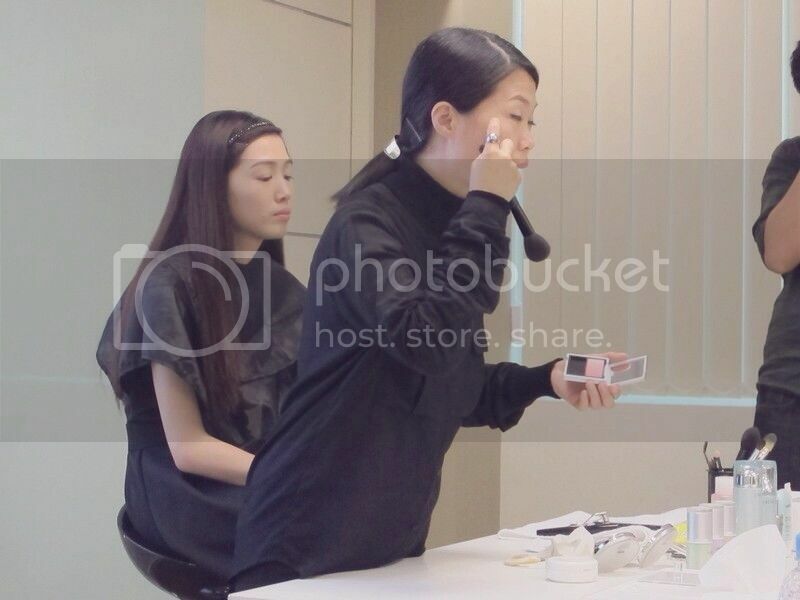 Application of blusher on the model's face. These were some of the products that were used to create the K-beauty look. 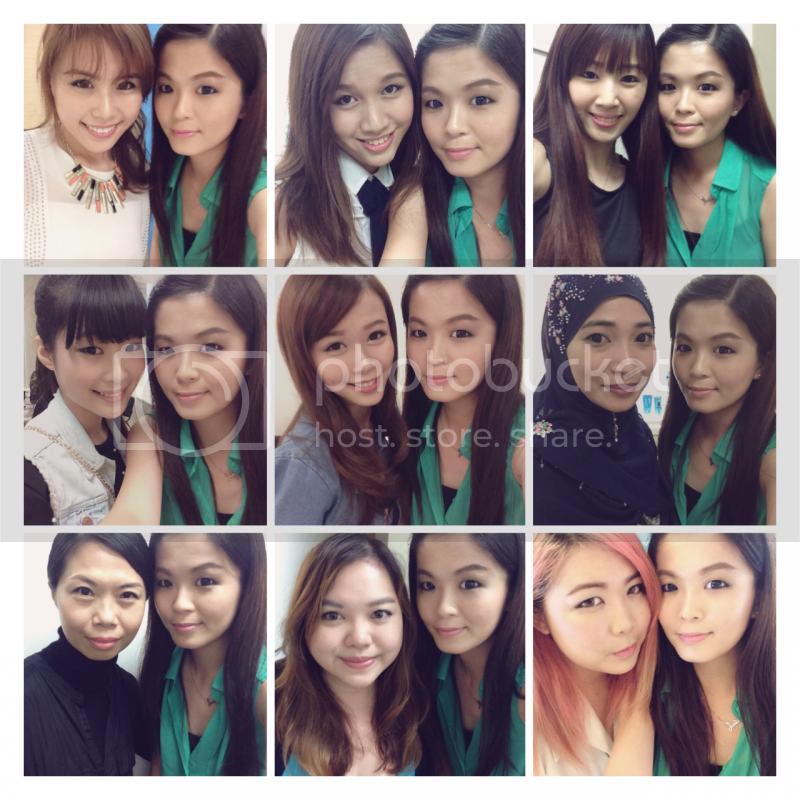 Below are some of the photos taken with the rest of bloggers, Miss Geraldine and Nuffie, Sue Ann. During the night, I tried on the skincare and makeup products and I am going to show you guys right here. All the products that I am going to try to create the K-beauty look. 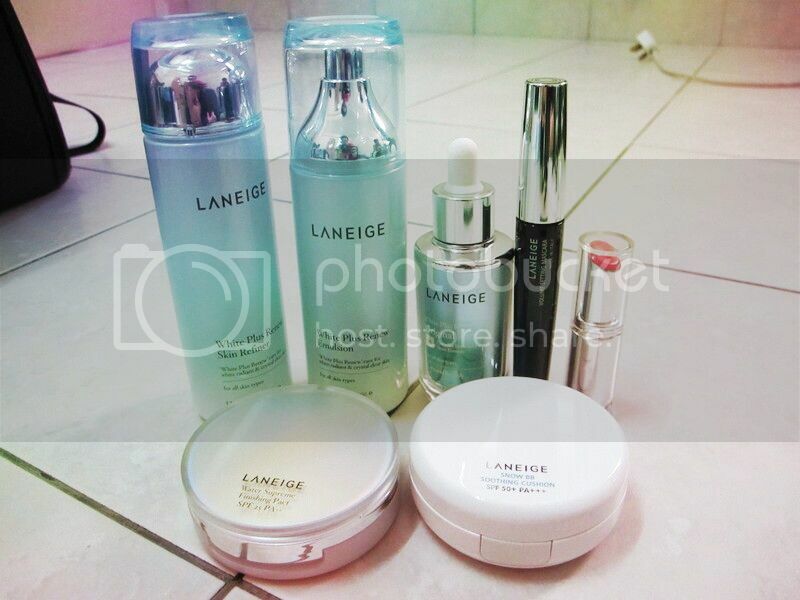 Thank you Laneige for the awesome products. 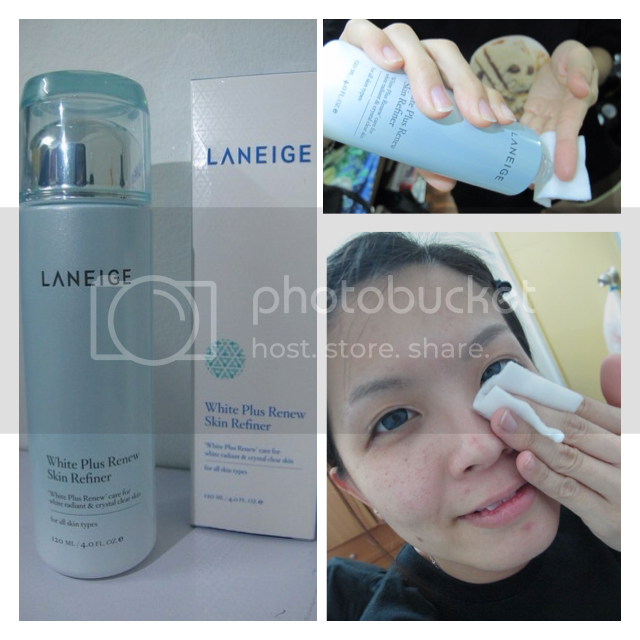 The first step is Laneige White Plus Renew Skin Refiner to remove the makeup residues, impurities and dead cells, delivering instantaneous effect on improving skin discoloration. 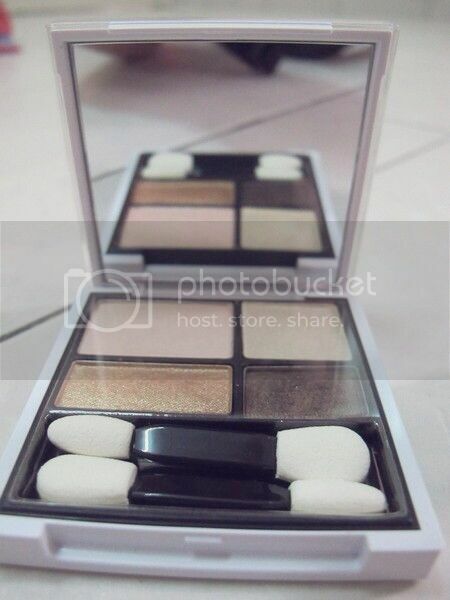 It also serves as booster to enhance the effects of the whitening ingredients for the next skin care step. The Swiss White Lupine ingredient prevents moisture loss on the skin epidermis, keeping your skin hydrated and transparent. Direction to use: After cleansing, take proper amount onto a cotton pad. Lightly wipe along the skin texture in order of cheeks, forehead, nose, lip area and neck from the inside to outside. Bear in mind that you have to avoid eye area. 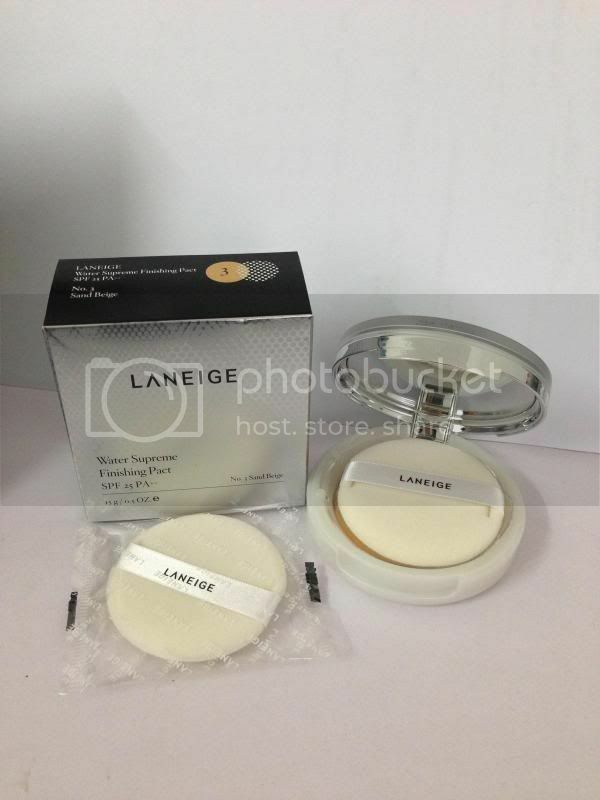 Laneige White Plus Renew Emulsion forms a moisture barrier, keeping the skin brighter and more transparent. 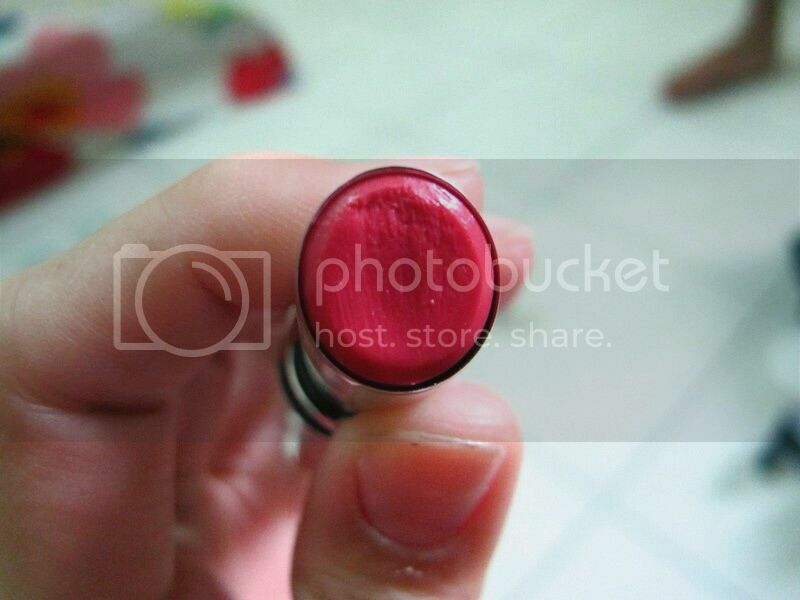 It is non-sticky with fresh texture which softens and calms skin. Besides that, with watermelon extract, it replenishes moisture to weary skin. Direction to use: After using skin refiner, take an appropriate amount and lightly apply it in the order of cheeks, forehead, nose, lip area and neck from the inside to outside. Bear in mind that you have to avoid eye area. Laneige White Plus Renew Essence helps to make your skin look brightened, transparently luminous and replenished with moisture. The whitening essence that rapidly absorbs into skin, leaving the sensation of smoothness with the snow-melting cool and fresh application feeling. It delivers the sleek skin texture and evenly smooth skin tone. With additional of grapefruit peel extracts, it gives more clarified look with the inner skin purifying effect and marshmallow extracts deliver skin nutrients and recovers the skin flexibility effect. Directions: For the morning and evening skincare, at the essence stage, pump two times and lightly apply it in the order of cheeks, forehead, nose, lip area and neck. Lightly press the palms down onto the face for the better absorptions. A primer base with the supple aqua texture to smoothen the surface of skin as moisturizing primer and prepares it for foundation with moisture coating. 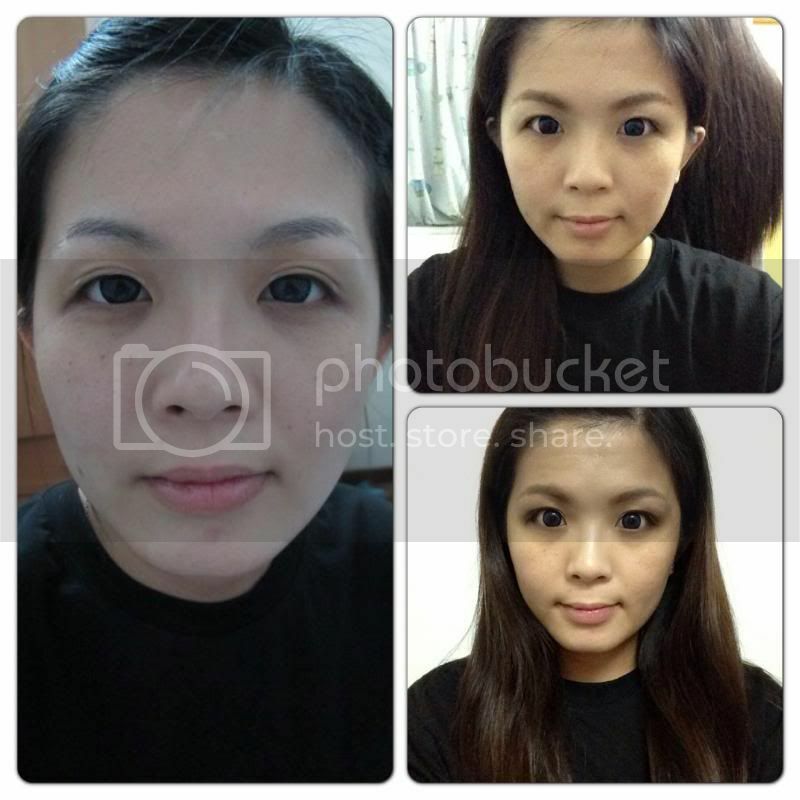 Apply after basic skincare regimen and as the first item of makeup. 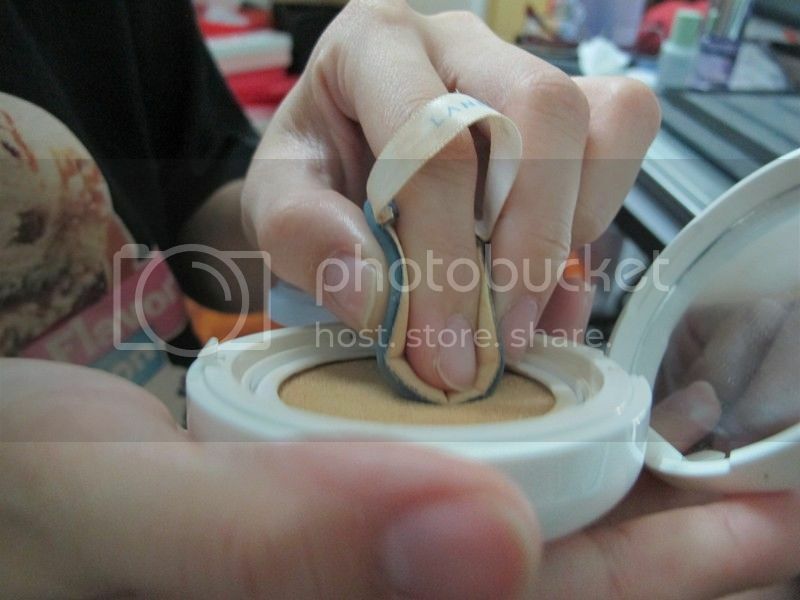 Next, apply an appropriate amount of fingertip and spread evenly, starting with the broadest part of the face. 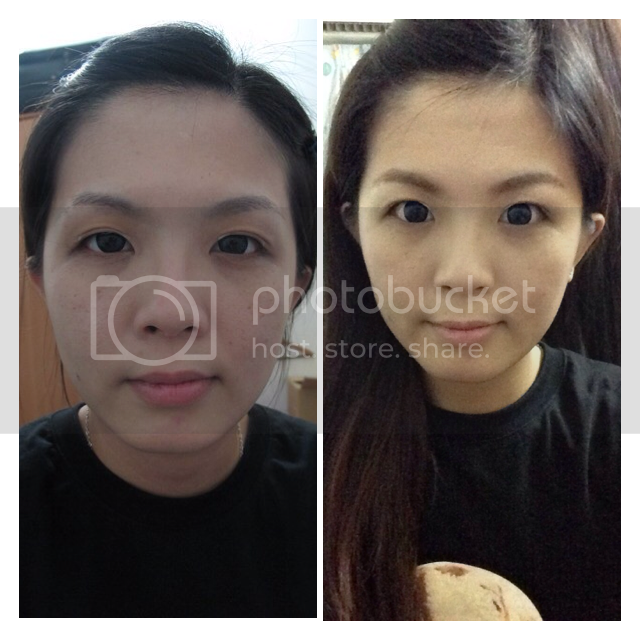 Try to apply a thinner layer on the T-zone and chin where there is more sebum secretion. A clear finishing pact that applies smoothly and evenly for moisture-enriched skin. 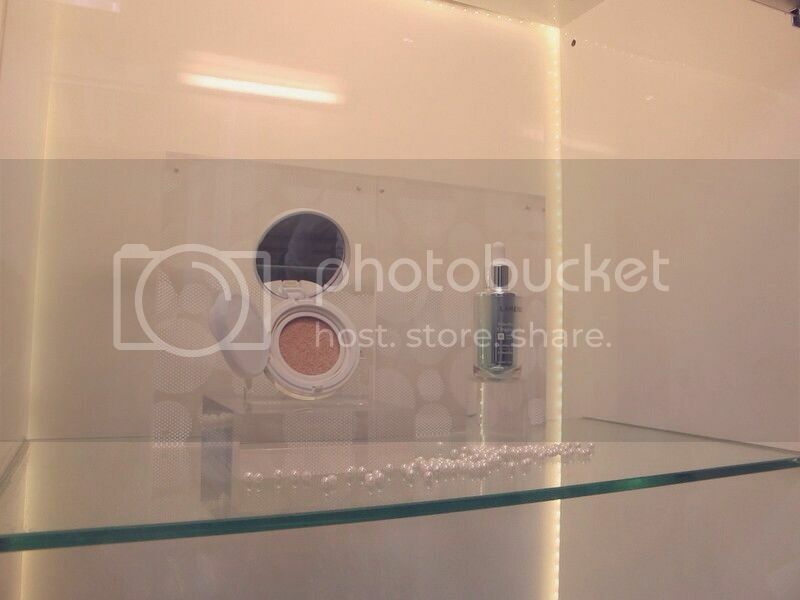 It is used after Snow BB Cushion and primer base for longer lasting coverage. For smaller area such as eyes, lips and nostrils, fold puff into half and gently press with the remaining amount of powder. Apply onto puff and smooth along the texture of skin. Then, pat to increase adherence. Apply another layer to improve coverage. If there is no more content after you press the cushion with your finger, it means that the product is finished. 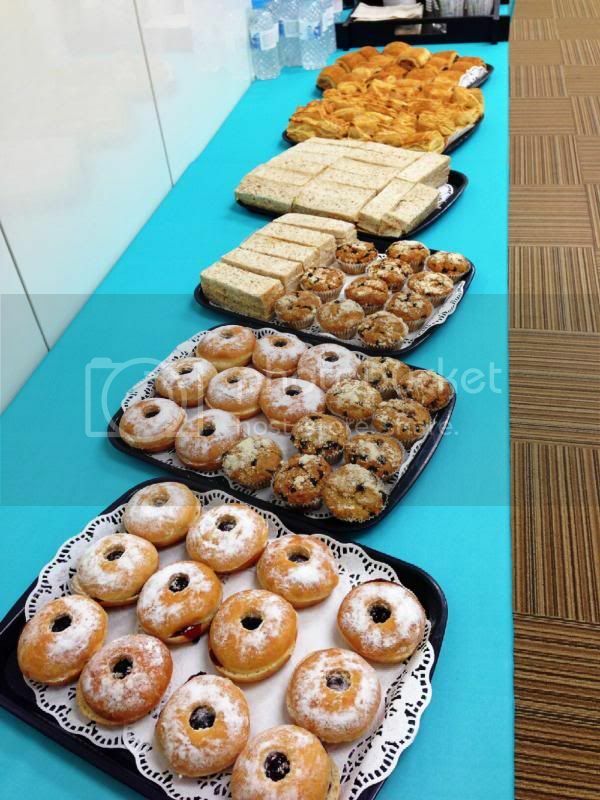 Replace with a refill. Keep the puff clean all the time and gently massage it in lukewarm water with neutral detergent or puff cleanser to wash it. Rinse thoroughly until the detergent is washed away, release all moisture, and dry completely in a shadowy place. This way, you can use it for an extended period of time. Always recap after use. If it is not stored covered, helpful moisturizers and other ingredients can evaporate to shrink the contents. Last but not least, here's the two final look for day and night. Both day and night look. Can you see any difference? 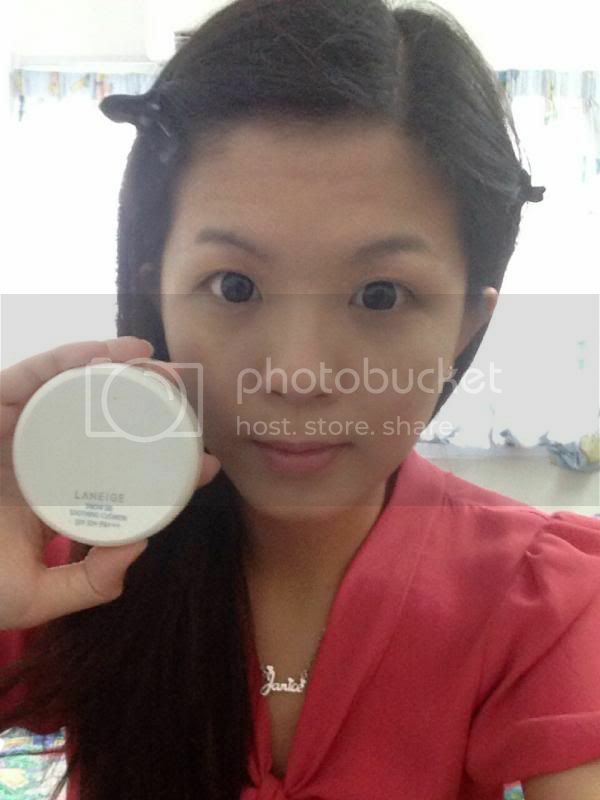 I love how Laneige Snow BB Cushion gives me the smooth and supple look. I finally can have flawless skin. 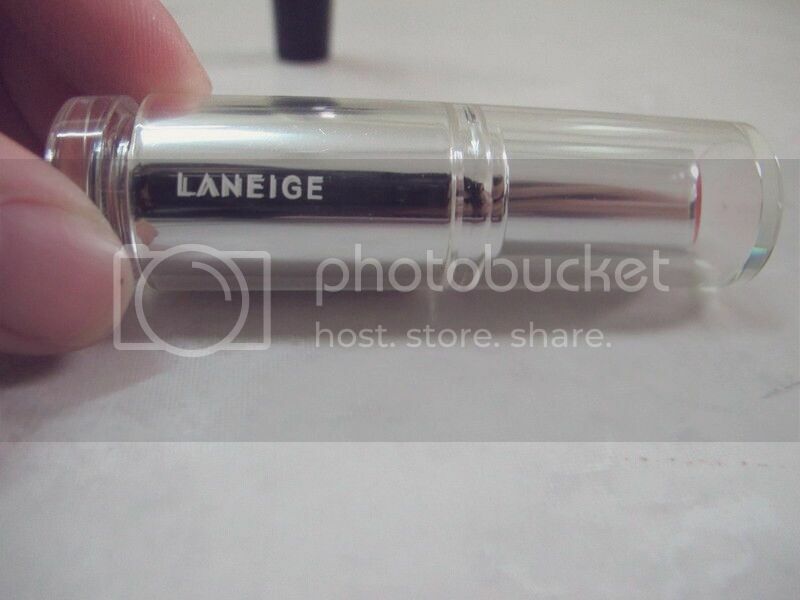 All thanks to Laneige and Nuffnang! Seriously after using these products for almost a week, my skin has shown some improvements. My flawless skin boost up my confidence already. I am so happy with the results! 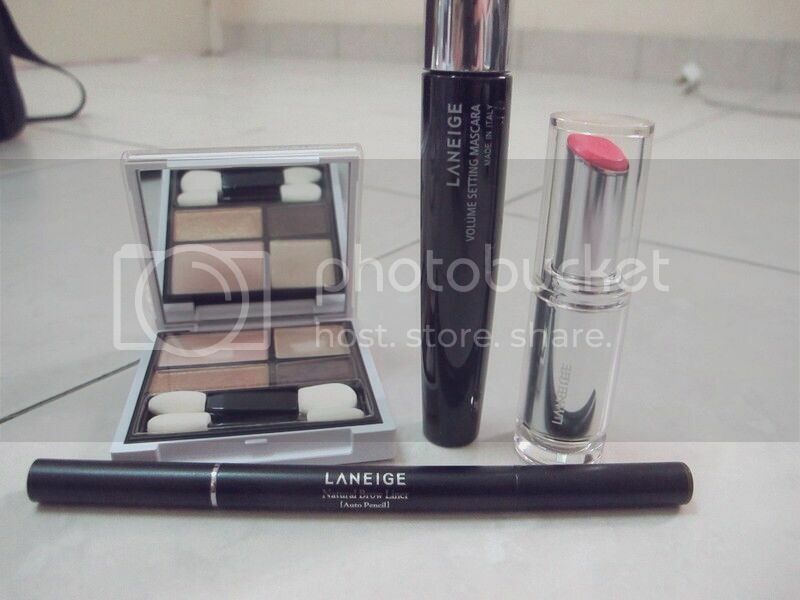 Thank you Laneige for the wonderful and amazing products and Nuffnang for the opportunity! Yay! 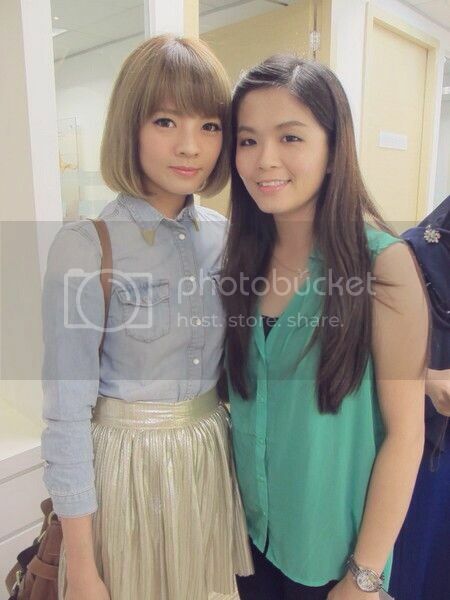 Thank you Miss Geraldine for the awesome makeup tips that day! To all the readers who wish to know more makeup tips from Miss Geraldine, do follow her at Facebook for more tips alright?